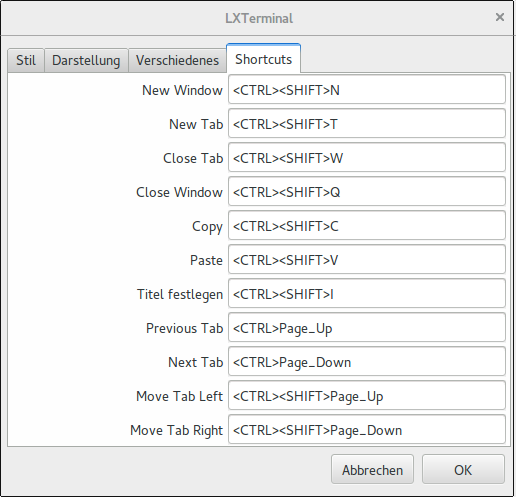 Is there a way to change or add keyboard shortcuts within the LxTerminal application? My specific desire is to change the bindings for previous and next tab so they match the shortcuts in my other environment, but I'm interested more generally if this is do-able across multiple applications, or if each application keeps shortcut key bindings in an app-specific location? In this case you need an app-specific solution. For cross-application configurations this page is helpful. Unfortunately it is not possible to add new shortcuts. lxterminal 0.2.0-1 (vivid) has a property tab for shortcuts. In previous versions, there is no such possibility. I also tried to use the configuration of the newer version with the older version. It does not work. Not the answer you're looking for? Browse other questions tagged shortcut-keys shortcuts lxterminal or ask your own question. How to switch tabs Terminal using Ctrl + Tab? Using Tab in an LXTerminal keyboard shortcut?